DeSoto Mayor Curtistene McCowan gives State of the city address. 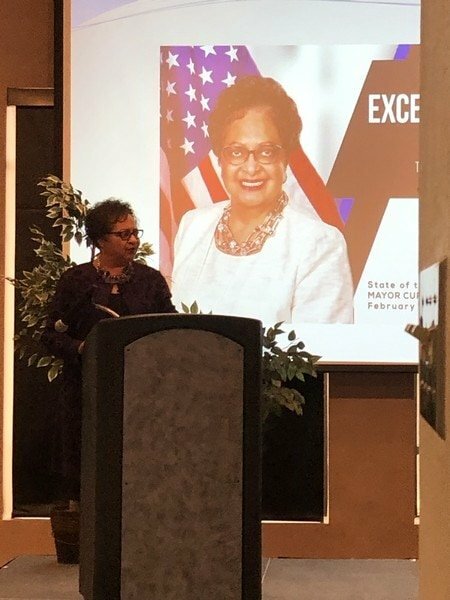 DESOTO—On Thursday, February 7, 2019, the DeSoto Chamber of Commerce welcomed Mayor Curtistene S. McCowan to the City’s Civic Center to deliver her 2019 State of the City Address before a lunchtime gathering of members of DeSoto’s business and civic communities. 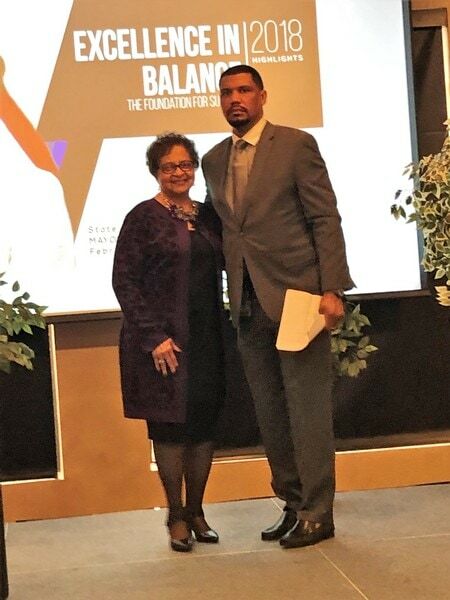 The theme of this year’s address, “Excellence in Balance,” provided Mayor McCowan with the opportunity to highlight the City’s successful efforts to strengthen the municipal workforce, upgrade finances and jumpstart economic development. By exercising responsible governmental stewardship, the Mayor noted that DeSoto has been able to hold the line on property taxes for the past eight years while reducing them for the last four, secure two bond rating upgrades, generate impressive growth in revenue and reserve funds, build a stronger workforce, improve service delivery, and lower the crime rate. One of the biggest success stories, and challenges, that the Mayor spoke of in her address was the administration’s efforts to acquire and retain high-quality workers. DeSoto’s municipal workers are highly sought after and are frequently hired away by other cities in the area. In order to retain their best workers and recruit additional talent, the City Manager’s Office commissioned a compensation study to calculate the value of workers in the region so that the City could adjust salary rates and benefits to be more competitive. This included distributing bonuses to many of the longest serving workers, and offering signing incentives to experienced police officers and firefighters looking to serve and protect DeSoto residents. Another highlight of the Mayor’s speech was the creation and subsequent growth of the Hampton Road Economic Development Corridor between Pleasant Run and Belt Line Roads. Current developments include a Dunkin’/Baskin Robbins quick service restaurant that formally opened last Saturday (2/2), construction on a 100-bed transitional skilled nursing facility at Hampton and Barrows Place, and upcoming groundbreakings for Fuzzy’s Taco Shop just west of Hampton on Pleasant Run and the Smoothie King at Hampton and Pleasant Run.